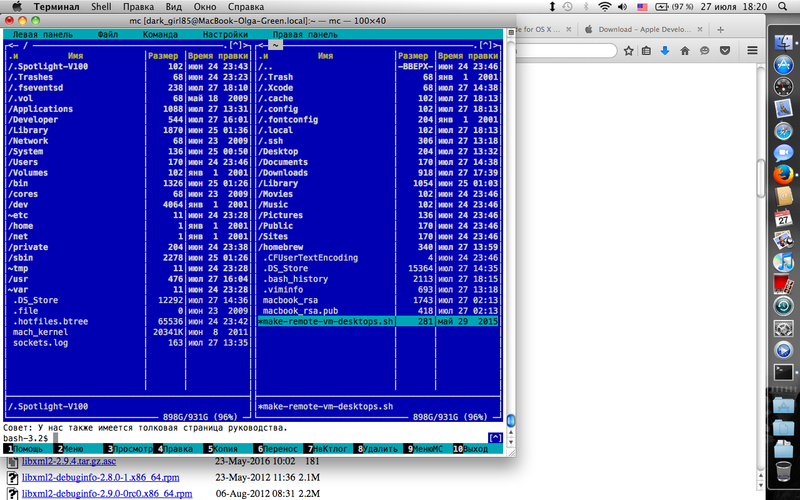 Yesterday i’ve installed Midnight Commander on OS X 10.6.8 SnowLeo. It was a good quest, more interesting than usual linux work. First of all 10.6.8 – old & unsupported. This is general problem. Second – you have no built-in package managers like apt, dnf or yum on mac. But there are third-party tools like macports & homebrew. I used homebrew. General steps were: install homebrew, install xcode 3.2.6, update homebrew, install mc. Last step was failed for me. Command brew install –v mc works fine ‘till libxml2 dependency installation. On libxml2 I’ve got error – 10.6.8 is unsupported. After some experiments i’ve downloaded libxml2 2.9.4, built it & installed it with commands from homebrew (it prints commands while installation). After that i’ve copied libxml2 bins to /usr/lib & made link /opt/local/libxml2 to /usr/local/Cellar/libxml2/2.9.4_3. After those tricks I’ve restarted brew install –v mc. Magic works – brew skip libxml2 dependency & continue install other dependencies. Midnight Commander works great! Only issue – iTunes fails due to x64 arch of libxml2 (in x64 SnowLeo 10.6.8 built-in libxml2 2.7.3 is i386 arch, imho it's nonsence). So if I need to start iTunes – I modify link libxml2.dylib at /usr/lib to i386 library.